Some time ago I received an email from a lady of the Office de Tourisme of Buxy with the question if she could use some of my pictures of the Romanesque churche in Saint-Martin-du-Tartre for a tourist guide of this typer of churches in the ccScc (a body uniting a number of communities in the South-Chalonnais). She had been browsing the internet in search of pictures, and she had stumbled, through the site “Bourgogne Romane”, on one of my picture albums. The guide was an initiative of the ccScc, not published before, and it would make an inventory of the 19 Romanesque churches in the area. 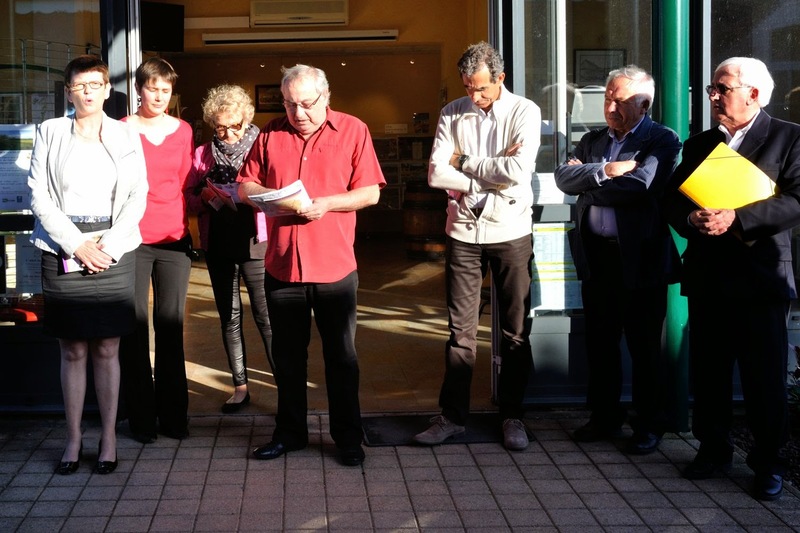 The lady coordinated the project, a group (Pastourisme), specialised in the churches of the diocese of Autun would write the texts, and the Chalon branch of a French club of amateur photographers would provide the pictures. In a word, why in heaven’s name did they need my pictures of that church? I am certainly not an outstanding photographer! The answer was a logical as it was simple. I visited this church for the first time on a foggy day in October 2012. The church was open (which is not always the case in churches around here), so I could shoot as many pictures of the interior as my heart desired. I visit rather a lot of churches in the course of time, hence I do not always remember whether a church was open or closed during a previous visit. When we were near that church again, this time on a sunny day in May 2013, I decided to make some pictures of the outside with a nice blue sky. The door was open, and just to make sure I had not missed it I walked in to take some pictures of the interior. This time however there was scaffolding up, making crossing and choir inaccessible, and it hid the interesting parts of this church from view. 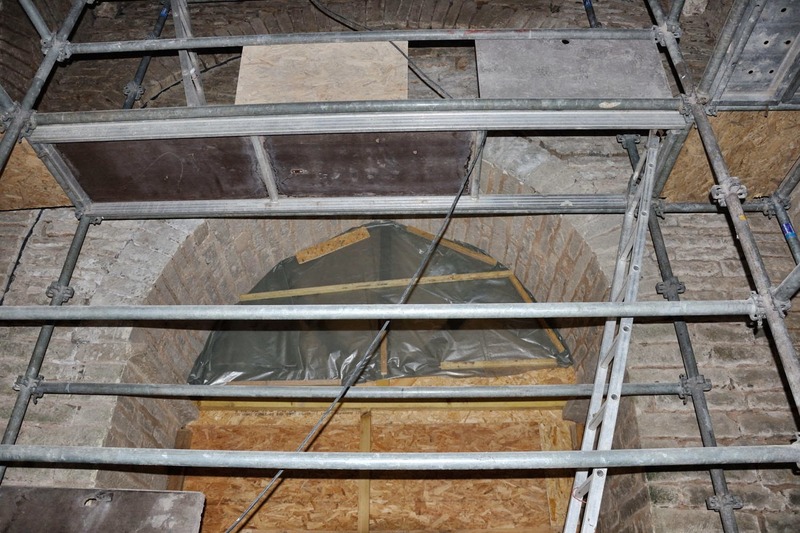 At the beginning of 2014, when the photo club was on its way to photograph the 19 churches, they found the interior of this church still under renovation; hence they could not take any pictures of the crossing and choir of the church. And that is where I came in the picture, like a ministering angel. 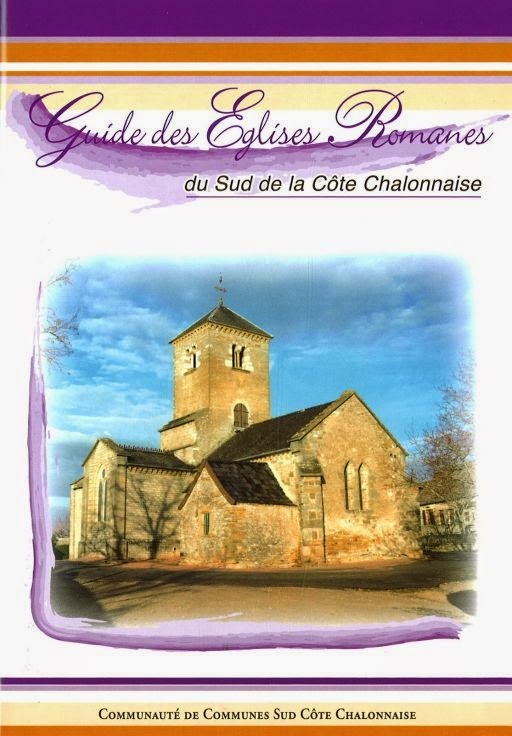 The lady asked for, and obtained permission to use my pictures, and in March I was invited to the opening of a picture exhibition of the 19 churches at the Office de Tourisme in Buxy, during which the guide would be presented to the public. The opening of an exhibition in this part of France consist most of the time of a number of interminable speeches, where each speaker extensively thanks all collaborators, their wives, their children, their servants, their neighbours and their pets. Just grin and bear it. After half an hour, in which my attention was waning, each one present received a free copy of the guide, at which it was aloso time for the obligatory glass of Crémant de Bourgogne and some snacks. The guide is now for sale in the town halls and the Offices de Tourisme in the area for the very reasonable price of € 5. And since I do not receive any royalties of this extravagant amount of money, I can, without moral dilemma, warmly recommend this tasteful booklet of 48 pages. It indeed contains a wealth of information on the subject, which is otherwise not at all or hardly available for those interested. 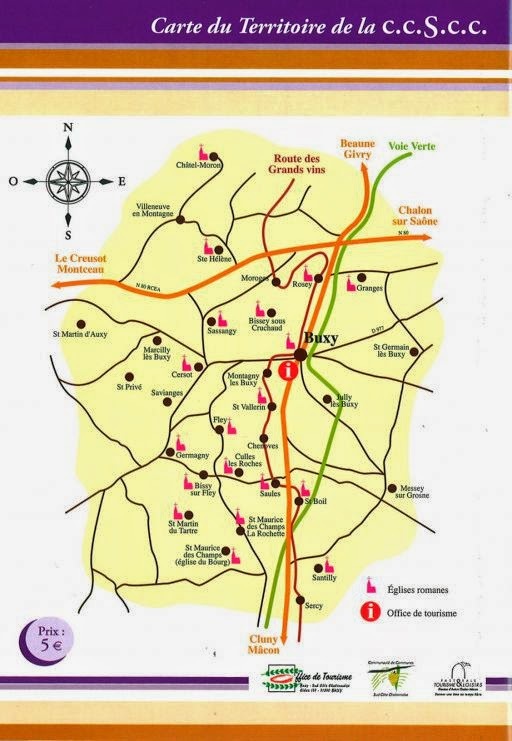 The above mentioned 29 churches are only a short distance away from La Tuilerie de Chazelle. 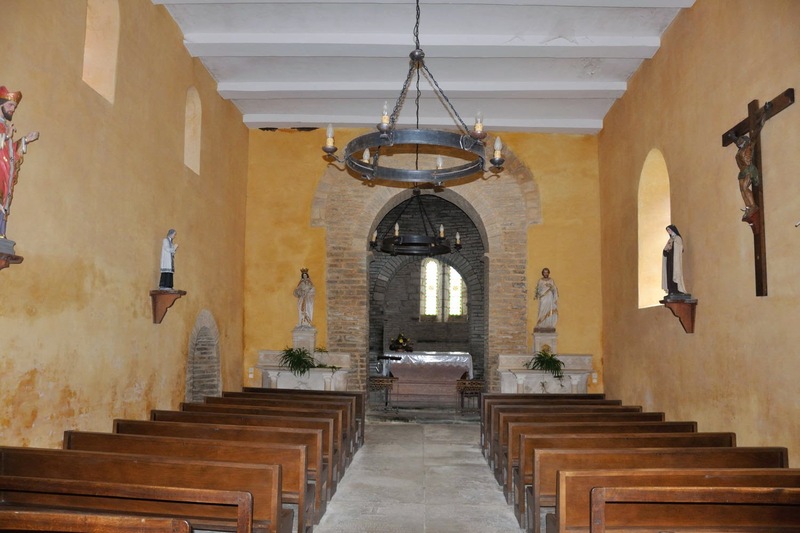 One of the things I have been looking for for a long time, and which I never found, is the Chapelle Saint-Nizier near or in Jalogny. The only clue I had came from ”Le site sur l'Art Roman en Bourgogne”; the chapel or remains thereof were near a source named after Saint-Nizier. Since Jalogny is not such a big place we decided to give it a go. The church of Jalogny we had found during previous missions without any apparent problems. A certain chapelle Saint-Pierre (in ruins), located on top of a hill with the same name was already a bit trickier. The hill was indicated on the map, however, we did not find one trace of a chapel. Of course the remains could be hiding in the bushes on the top of the hill, or in someone’s back garden, or even under a newly built house. 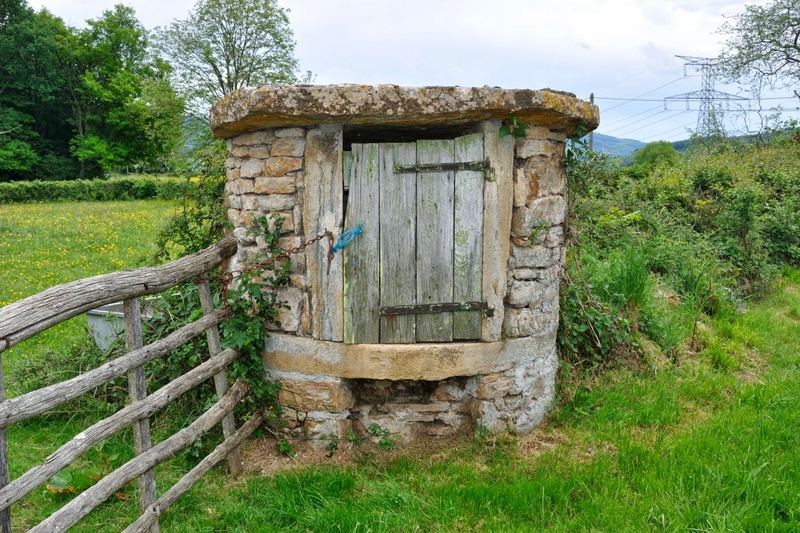 In the village itself we found a source or fountain, but that one was called Fontaine des Chèvres. That seemed to be the end of our quest. 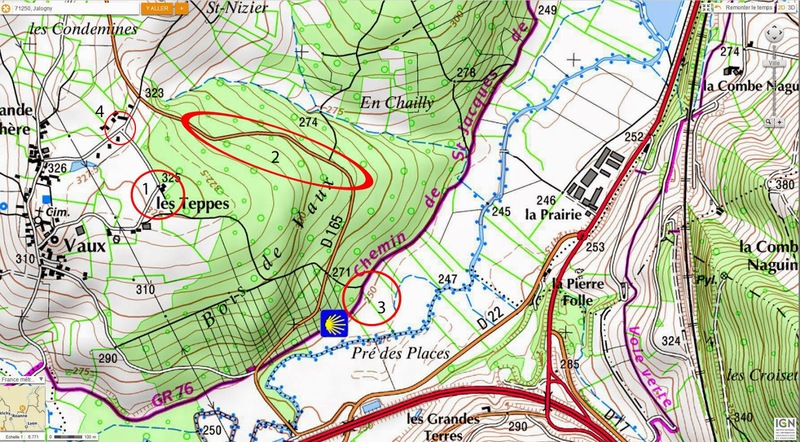 Until I discovered, that the French internet site Geoportail, Google Earth’s small cousin, not only had aerial views or satellite pictures available, but also a wide range of different maps with a wide diversity of accuracy. 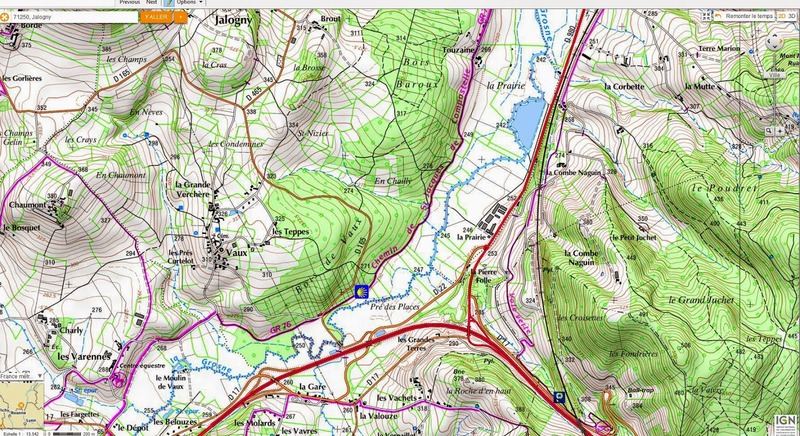 One of the available options was the IGN map, not dissimilar to an ordnance survey map. 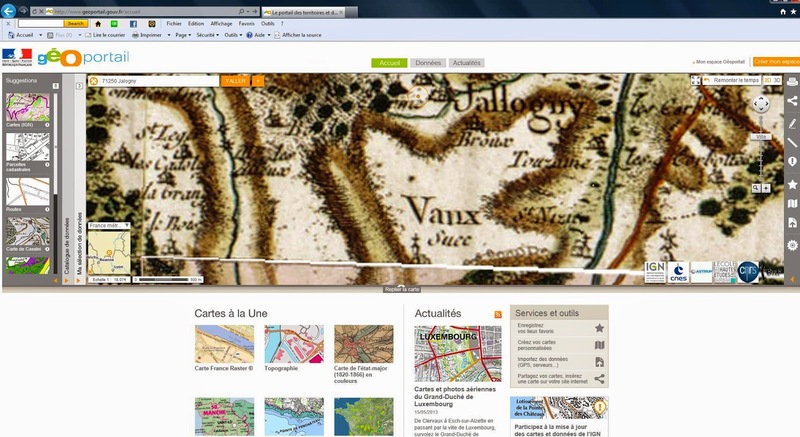 On this IGN map, in between Jalogny and Vaux, there was a field with the name Saint-Nizier printed on it. Once, while we were in the vicinity, we met a farmer on a tractor. He knew about a source on the edge of the forest, not far from where we met him (see the red circle with no. 1 written in it in the bottom IGN map). We decided to drive in the direction the farmer had indicated, towards the circle with 4 written by it, turned right there, and turned right again at the next crossing (with 323 written by it), entering the forest. Underway we had seen nothing of interest, and due to the weather and the amount of water that had saturated the soil it was not feasible to enter the forest, and a drive along the edge of the forest revealed nothing at either side of the road. When we got home I studied the map again, this time finding a blue dotted line along this road: water! Where there is smoke, there is fire, and where there is water there must be a source somewhere. During a trip with better weather and soil conditions we investigated this option, went into the forest, looked for the brook, but all to no avail (see the ellips with 2 written by it). In the meantime I had discovered that Geoportail could also produce the Cassini maps. These maps, made by the 18th C. French cartographer César-François Cassini, showed the Chapelle Saint-Nizier in all its glory, although not where we thought it should be. The chapel was located along a path used by pelgrims to Santiago de Compostella, a chapel not being unusual along those sort of tracks (see the red circle with 3 written in it in the bottom IGN map). And again we drove to Jalogny / Vaux, and again in vain. But this blooming chapel should, sure as hell, be somewhere around there! When looking at the map again I got another brainwave. 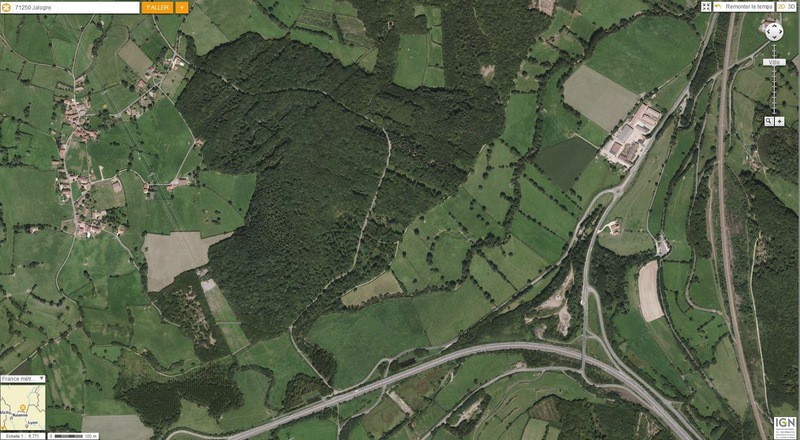 Not being hampered by a good memory for places I "discovered", at the edge of the forest (see the red circle with 1 written by it) a spot with some buildings. One of them could well be a source, or even better, a chapel! When I mentioned this to my learned assistant, she dampened my enthusiasm by saying that that was the place where it all started. But, since you never know, we decided to drive back to this spot. Needless to say that it was indeed the farm where we had started our investigations. However.... when we rounded the corner (red circle with no. 4) I had seen, from the corner of my eye, a cylindrical hut. When we drove back we found there a covered cylindrical structure, with a little door. When I peeked through the door I saw a pit, source or well, albeit dry. A bucket however "proved" that it once had been a pit. And that is the reason I officially close this investigation into the chapel of Saint-Nizier. 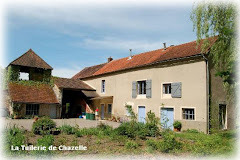 For those of our guests of La Tuilerie de Chazelle who are the first to locate the chapel Saint-Pierre, or even better, the correct location of the chapel Saint-Nizier, we have a bottle of wine in the fridge as a reward for their effort!